Sloped Low Profile Covers - Get Light in your Basement! Window Well Experts » Blog » Sloped Low Profile Covers – Get Light in your Basement! Our Sloped low profile covers are a great way to let the light shine in your basement! 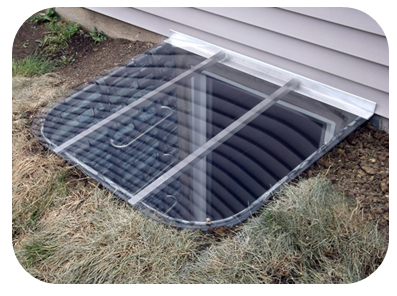 Unlike many mass produced window well covers, our Sloped covers are made of nearly indestructible polycarbonate (brand name Lexan®). The plastic we use is UV treated to prevent yellowing, cracking and breaking under heavy snow and ice loads. We make a variety of sizes that fit a number of common window wells. We ship quick release clips and the screws necessary to attach these long lasting covers to your window wells, not your home. These clips allow for easy removal for home maintenance and fresh air ventilation. Please look at the photos below. These clips release with a push from beneath in case of emergency, yet hold your cover in place in the face of winds, rain, snow and ice. Our Sloped covers will bear up to 400 pounds, the weight of two adults without collapsing.